He then went on to list a litany of bands (Whom shall remain nameless), and begged the question, “Have you taken the time to check them out?”, because according to him, if I hadn’t, than I was the reason rock music was going to die. Why, yes. Yes, I have checked them out. And truth be told, I didn’t care for any of them. I found them all to be lackluster, uninspired, and undeserving to carry the torch that their forefathers before them ignited to procure their everlasting niche in history. Entertainment that matters must be able to shape and mold generations as well as play to the heart, soul & spirit of all who embrace it. The bands that the aforementioned writer thought I should be listening to were mediocre at best and unworthy of my time. I contemplated the overall diversity of musical opinions, and how they actually aren’t that different than say, attitudes regarding religious, political, racial or socio-economic issues. Everybody’s got a say, and ultimately, it’s not always what you may want to hear. I honestly feel that much of the music we are subjected to today is not unique enough to adequately hold the attention of the seasoned listener. Personally, I blame record companies as much as I do artists for repeatedly serving up the same old regurgitated plate again and again to audiophiles who desire and deserve more than they’re being offered. The good news is, there are still artists as well as record companies worthy of exposure who have honed their craft and understand the true meaning of the word “art”. The really good stuff has to be mined like precious metal. It’s there, you just have to work a little harder and dig a little deeper to find it. Which is the reason I’d like to say thank you to the staff at Blind Pig Records for maintaining and promoting a roster of artists deserving of a closer listen, and for preserving the thing we as listeners cherish most; Quality. 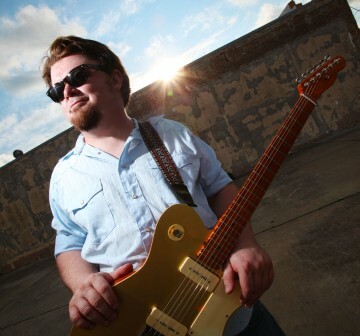 Damon Fowler has been described as “The next big-time guitar slinger” by the Chicago Times. His playing has been compared to the likes of Johnny Winter, Jeff Beck & Duane Allman. His mastery of slide guitar, pedal steel and Dobro is unmistakable and distinctive; his singing and songwriting skills, well-crafted and polished. The music is decidedly Southern, enveloped in blues, country and gospel. His versatility of musical style demands your recognition and immediate attention. If you are a fan of Southern Blues, you need to check this out. His third solo effort comes on the heels of his work with the band Southern Hospitality, whose 2013 album Easy Livin’ was released to critical acclaim to blues critics worldwide. Sounds Of Home truly delivers to listeners in need of a straight, arterial shot of smooth, Southern sunshine. From the fiery, heartfelt blues of “Thought I Had It All” to the soothing, soul rendering gospel of “I Shall Not Be Moved”, this is an effort worthy of a “start to finish” listen, bursting with fresh originality. Raucous, moving and fulfilling, Damon Fowler’s Sounds Of Home is the gold you’ll find when you dig a little deeper to find the good stuff.